As a voltage reference, the Zener diode D1 is used, and a PNP transistor (Q1) is used to regulate the output voltage. 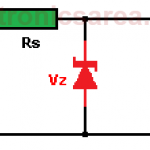 To achieve the stability of the output voltage, this voltage is fed back to the non-inverting input of the operational amplifier, through the resistor R4. 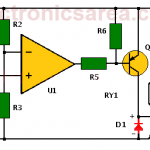 Potentiometer P1 is used for fine adjustment of the 12V power supply. 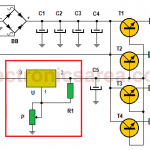 How the 12 volt power supply works? 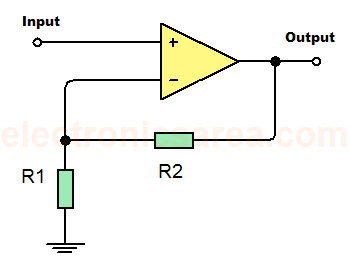 If the output voltage drops, the voltage at the non-inverting terminal of the operational also drops, just like the output of the operational amplifier, causing the transistor Q1 to conduct and raise the voltage output. This way the voltage output is stabilized. Also the output impedance is very low, due to the negative feedback. The Op. Amp. output impedance is also reduced by using the capacitor C1. The Zener diode D2 has also been included so that the regulated output of the operational amplifier can operate approximately 7 Volt below the unregulated input. This way, the regulated output is maintained until the PNP transistor is saturated. This means that the unregulated input can fall below (within approximately 200 mV) of the regulated output. The output of the unregulated source (A) can be between 30 and 12.2 V. In this design the output is at approximately 18 V.
Note: The unregulated output (see point A in the second diagram) is connected to the unregulated input of the first diagram.